Experiments will be performed in several lakes close to the Seeon Limnological Station. We will open for TA to specific experiments, but also invite scientists to test own specific ideas with individual experiments. We additionally welcome groups developing own research questions that address investigations of the pelagic-benthic coupling in aquatic systems and its potential interactions with stressors. Such projects could include experimental investigations of predictions from theoretical models or investigations of the effects of stressors on the strength of benthic pelagic interactions. Our field station, located in the middle of a lake district in upper Bavaria, which was formed after the last ice age 10.000 years ago, offers ideal conditions for the performance of large-scale mesocosm studies. Its infrastructure allows performing field experiments at different scales in about 60 nearby lakes showing different physical, chemical and biological characteristics. Some lakes are monitored since 30 years. The mesocosm system at SLS is highly replicable (up to 60), very mobile and customizable to the topic. We offer free floating or moored mesocosms suspended in water (10 000L regular), which can range from few liters to 60 000L. Potential experimental manipulations are, but not limited to: light intensity, spectral composition, nutrient supply rates, food web structure, and food web composition. There is also the possibility to use several 1000L tanks with an automated heat control system. Available instrumentation can be found below. A total of at ca. 320 person days will be allocated to external users through Transnational Access provided under AQUACOSM for 2019. It is anticipated that AQUACOSM will support stays of at least 5 persons for ca. 64 days, or potentially other combinations. If you are interested, please contact us (stockenreiter@bio.lmu.de; stibor@bio.lmu.de and seeon@bio.lmu.de) well before the application deadline, so we can advice you about possible options. Introduction to the project: Biodiversity loss is often accompanied by a loss of traits related to resource use and growth, which are important for food web dynamics and trophic transfer efficiencies. In the DYNATLOSS II project, we specially focus on the feedback loop from reduced phytoplankton trait diversity to phytoplankton dynamics via diversity-mediated shifts in zooplankton. We will address this general objective with field experiments with natural plankton communities to estimate the direction and strength of total feedback effects. Additionally, we will analyse the individual components of the complex and multifactorial set of feedback effects (mainly by laboratory experiments). Our work programme will focus on the following main research question: Can altered grazing, due to shifts in phytoplankton diversity results in multiple (and partially interdependent) feedback effects? We will address this research question with a chain of testable hypotheses. Field experiments allow analysing total feedback effects under natural conditions. To disentangle individual feedback mechanisms such as linked to grazing dependent size distribution and nutrient availability, additional, highly controlled laboratory experiments will be performed. 2) Experiments on benthic pelagic coupling and the sensibility to heat waves and agricultural run-off. 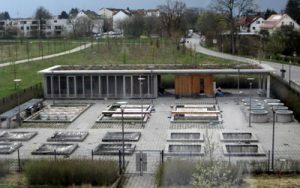 At LMU Munich Seeon Limnological Station (SLS) mesocosm experiments will be performed in several lakes close to the SLS. We will open for AQUACOSM TA to specific experiments, but also invite scientists to test own ideas with individual experiments. The focus of our research at SLS is on experimental analyses of limnic food web dynamics. We also perform experimental analyses of theoretical food web models in aquatic environments. Such experimental analyses can help to bridge the gaps between results from theoretical models and field observations. At least 315 person-days will be allocated to external users during 2018 of AQUACOSM Transnational Access provision. Users are encouraged to apply for support by AQUACOSM to participate in experiments that are already planned and funded by the DFG, the Bavarian Government and an EU Career Integration Grant (CIG) to address effects of nutrient stoichiometry on lake food-web dynamics, consequences of microbial biodiversity loss for food-web efficiencies and the genetic and ecological characterization of invasive aquatic species. We offer approved users AQUACOSM Transnational Access to SLS for up to 6 persons for 40-45 days. We are especially seeking for experts working in microbial ecology, modelling and limnophysics. 1) BIODIV – Interplay between trait diversity and ecological dynamics using aquatic communities as model system, Project lead: Maria Stockenreiter, March –May 2018. This project focuses on the effects of diversity loss and trait dynamics in natural plankton communities. Considering traits as mechanistic links between biodiversity loss and ecosystem services we focus on questions a) how a loss of traits is affecting phytoplankton production, zooplankton composition and food web transfer efficiency? and b) do such trait dynamics result in feedback effects on the phytoplankton community? These questions will be addressed with diversity manipulated natural phytoplankton communities in laboratory and large-scale field experiments. 2) INVASIVE – Genetic and ecological characterization of invasive aquatic species, Project lead: Herwig Stibor, August 2018. The freshwater jellyfish C. sowerbii is one example of a recently globally distributed species, which originated from China. Although mass occurrences of medusa were recorded and effects on aquatic food web dynamics are expected, the consequences of the jellyfish’s introduction to aquatic systems has not been analyzed yet. To figure out the trophic position of medusa, mesocosm experiments will be conducted. Additionally, combined analyses of genetic diversity and ecological function of this species, will allow a better understanding of cause and effect relationships within aquatic food webs exposed to invasion. We additionally welcome groups developing own research questions that address investigations of the pelagic-benthic coupling in aquatic systems and its potential interactions with stressors. Such projects could include experimental investigations of predictions from theoretical models or investigations of the effects of stressors on the strength of benthic pelagic interactions. Potential experimental manipulations are, but not limited to: light intensity, spectral composition, nutrient supply rates, food web structure, and food web composition. There is also the possibility to use several 1000L tanks with an automated heat control system. The facility will be open from March to late October however, if specific experiments require winter conditions, it is also possible to perform experiments from November to February. Typically, user defined own experiments can run from March to October preferable in slots where no groups specific experiments run, but are not restricted to these time slots. Our field station, located in the middle of a lake district in Bavaria, which was formed after the last ice age 10.000 years ago, offers ideal conditions for the performance of large-scale mesocosm studies. Its infrastructure allows performing field experiments at different scales in about 60 nearby lakes showing different physical, chemical and biological characteristics. Some lakes are monitored since 30 years. The mesocosm system at SLS is highly replicable (up to 60), very mobile and customizable to the topic. We offer free floating or moored mesocosms suspended in water (10 000L regular), which can range from few liters to 60 000L. 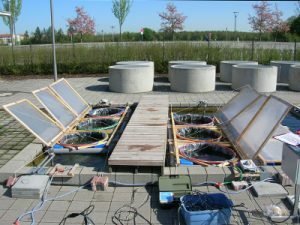 The LMU Mesocosms operated by the Aquatic Ecology group at the University of Munich (LMU) are situated at the Limnological Station Seeon 80 km southeast of Munich. 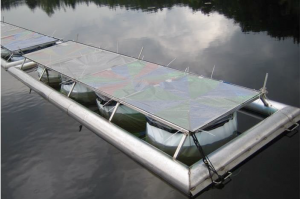 The infrastructure consists of 60 highly mobile mesocosms that are moored or free-floating (Fig. 6.11.1). 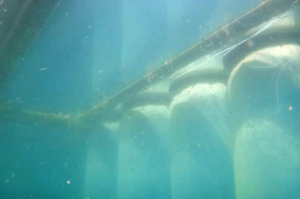 They vary in diameter from 0.9 to 2m, reach depths of up to 20 m, and can be filled in situ with lake water by submerging and then lifting floating rings, or by means of powerful pumps (10 m3/h). The high mobility of the mesocosms provides unique opportunities to deploy replicate experimental units simultaneously in several lakes, ranging from oligotrophic to eutrophic. About 60 lakes of glacial origin differing in size, depth, trophic state and species composition are available within a short distance; basic physical, chemical and biological variables of several of these lakes have been monitored for over 30 years. Potential experimental manipulations include, but are not limited to, light intensity and spectral composition, nutrient supply rates, and food-web structure and composition. Available facilities and equipment include a walk-in environmental chamber, a large plankton growth chamber, a 300-L indoor plankton cultivation facility, a four-wheel pick-up truck, a boat trailer and 6 boats. Probes for measuring standard physicochemical variables and chlorophyll enable fast in-situ characterization of water quality. The following and instruments equipment are available for chemical, biochemical and biological analyses in the lab, the latter focussing on phyto- and zooplankton communities: a multispectral PhytoPAM, a fluoroprobe, a FlowCAM, a CHN elemental analyser, 2 spectrophotometers, 2 spectrofluorometers, a spectroradiometer, an ion chromatograph, and high-quality microscopes. Fatty acid analyses by GC-MS are expected to be operational in early 2017. Numerous successful experiments have been conducted in the LMU Mesocosms over the past 20 years. This includes AQUASHIFT (2005-2010) and 10 other projects funded by the German Research Foundation (DFG) to assess response of lakes to changing light and nutrient conditions, stratification depth, temperature and plankton community structure. Casy Counter, Fluorometer, nutrient analyses, scopes, several labs for small scale experiments, multispectral PAM, 8-LED-based Algal Lab Analyzer, spectroradiometer, climate chamber. At least 945 person-days will be allocated to external users during years 2-4 of AQUACOSM Transnational Access provision. Users are encouraged to apply for support by AQUACOSM to participate in experiments that are already planned and funded by the DFG, the Bavarian Government and an EU Career Integration Grant (CIG) to address effects of nutrient stoichiometry on lake food-web dynamics, consequences of microbial biodiversity loss for food-web efficiencies and the genetic and ecological characterization of invasive aquatic species. However, independent experiments by external users can also be accommodated. LMU Mesocosm experiments typically run for 3 to 12 weeks between March and October. Access is offered to a minimum of 6 persons for 40-45 days each in years 2-4. Services currently offered by the infrastructure: The LMU Mesocosms provide unique experimental opportunities in a very wide range of pelagic lake ecosystems. Users have access to the laboratories, instrumentation, technical assistance, dormitories and lodging facilities at Seeon Limnological Station. Additional accommodation is available in various B & Bs within walking distance, as are shopping opportunities for daily needs. Users are encouraged to cooperate with local scientists at Limnological Station and the main university campus to take full advantage of the infrastructure and specific expertise. Support offered under AQUACOSM: All external users will have access to office and lab space, cars and boats as well as instrumentation available at SLS. Free bench space is available for users bringing their own large instruments. All users receive support from the scientific team, permanently employed technical staff and other service personnel operating the LMU Mesocosms. Furthermore, given a large pool of interested students, both undergraduate and graduate research can notably support experiments, as has been successfully practiced in the past.